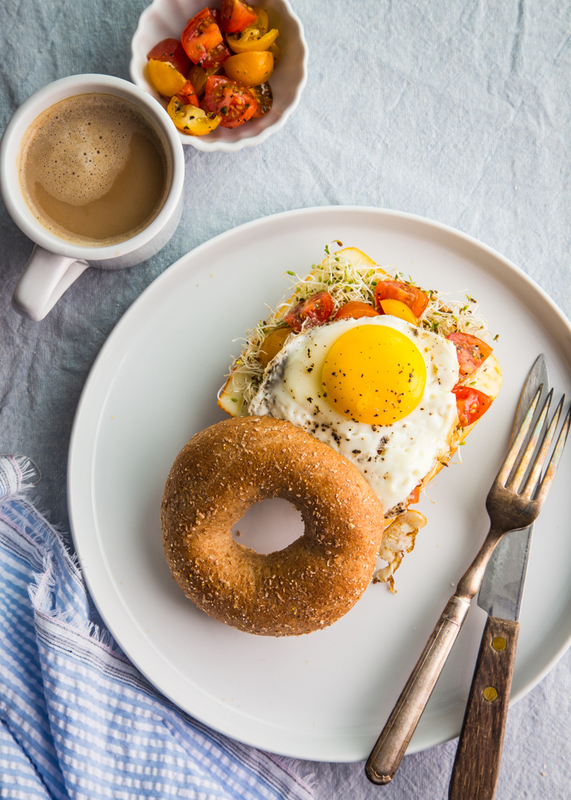 Breakfast sandwiches are a favorite weekend brunch in our home and this post, brought to you by Cobblestone Bread Co., features my favorite veggie breakfast sandwich with eggs, marinated tomatoes, hummus and alfalfa sprouts. I am so into spring right now! Seriously – the weather, the flowers, the sun, fresh air – it’s all making me feel so renewed. Energized. Happy. It’s a pretty great feeling. Spring also brings with it a new host of activity. Spring-cleaning is something that we’ve been tackling for a few months now, but we are finally able to throw the windows open and let in some fresh air. I spoke yesterday about our leap into putting our house for sale and it’s one that has brought feelings of nervousness, but more importantly excitement. The last few weeks have been a whirlwind of cleaning, decorating and just putting those finishing touches on areas of our house that have been needing a little polishing. 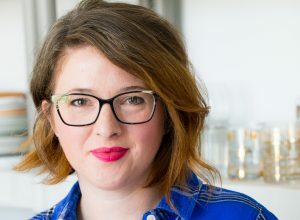 Amidst all of the housework, we are determined to keep up our weekend brunch routines, not wanting the new commotion to get in the way of the things we truly love to do. We often get together with our family for Sunday brunch, whether it is a simple little gathering, or something a bit more polished for Mother’s Day or Father’s Day (coming up!) I love a simple brunch spread – eggs, bacon, and toast. However, our brunch isn’t limited to Sundays. When it’s just the four of us at home on Saturday, my husband is always in charge of the brunch menu and it usually involves a deluxe breakfast sandwich. He is the king of sandwiches around these parts and I’ve learned a thing or two from him when it comes to building a great breakfast sandwich. Our Campfire Breakfast Burger was his brainchild, after all. Start with a great bread. 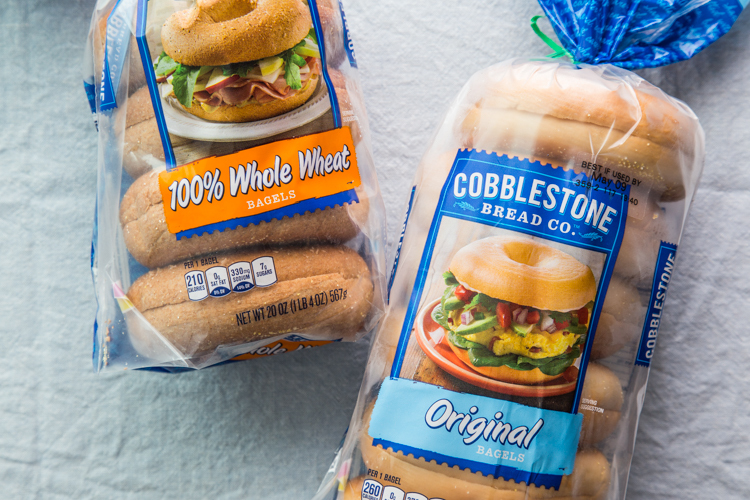 I like Cobblestone® Bread Co. Bagels for our sandwiches, because they come in both original and 100% whole wheat varieties and are soft enough to be the perfect texture for a sandwich. Plus, they soak up all that delicious egg so you don’t lose out on any of the flavor. Play with textures. 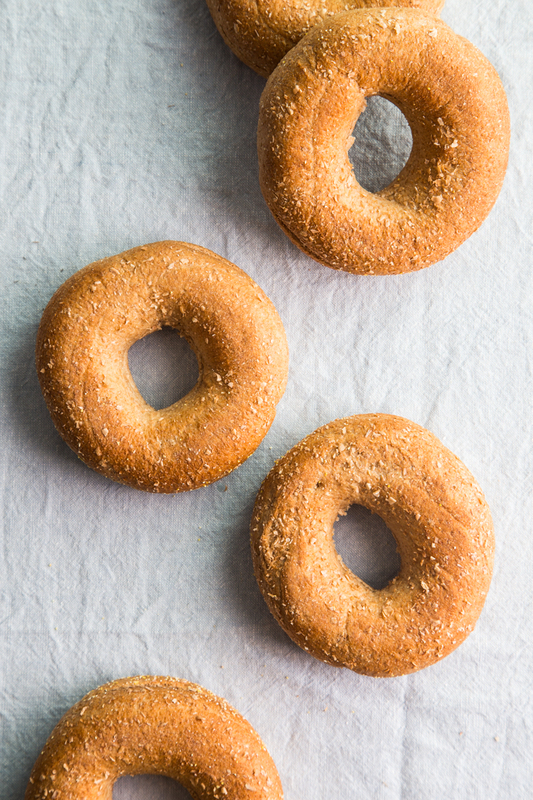 These CBC bagels are both sturdy (especially when toasted) and soft. The alfalfa sprouts add some nice crunch. The cheese and hummus add creaminess, while the crispy fried egg adds a little bit of everything. Add a variety of flavors! The hummus is nice and garlicky, while the quick tomato salad is vinegary and salty. 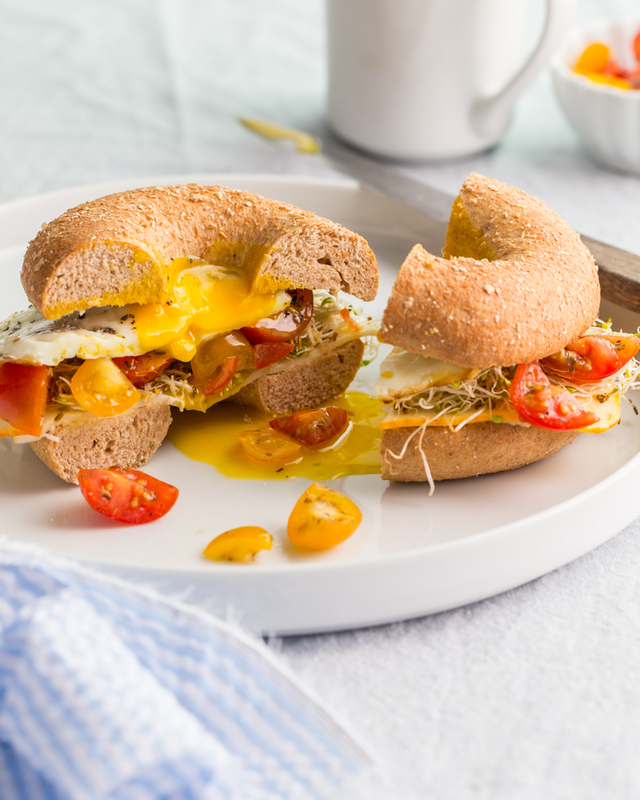 The alfalfa sprouts add a bit of clean fresh flavor and the egg adds a richness that soaks into the lovely bagel. I’ve made so many versions of this sandwich that it always ends up a bit different. I’ve added avocado and served it on one of CBC’s English muffins. I’ve added sautéed onion or mushrooms. But this combination is simple and crowd pleasing, making it perfect for weekday breakfast or a special weekend brunch. With all the hubbub of getting our house ready to sell, it’s amazing what a rockin’ breakfast sandwich can do to renew my energy. 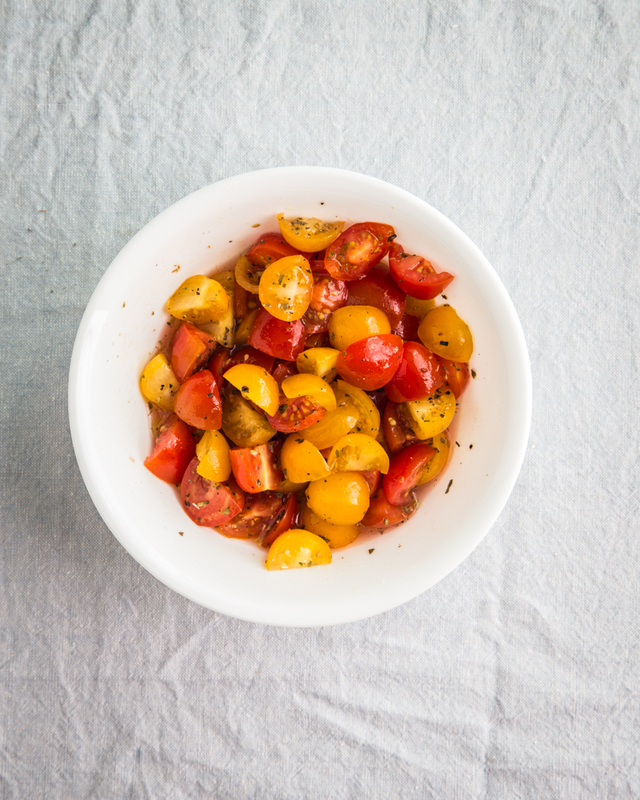 In a small bowl, mix together tomatoes, red wine vinegar, 1 Tablespoon olive oil, basil, oregano, salt, and pepper. Let sit while you prepare the rest of the sandwich. Place Cobblestone 100% Whole Wheat Bagels onto four plates. Spread bottom half of bagels with hummus and top each with one slice of cheese. Divide sprouts evenly among the bagels. Set aside. In a large skillet, heat olive oil until very hot. Crack eggs into skillet and cook until whites are set and yolks are still runny. Season with salt and pepper. Place one egg on each bagel and replace tops. Serve sandwich immediately. Enjoy! If I had the ingredients for these on hand right now, I’d race down to the kitchen to make them. Not only are they stunning, but they sound delicious. 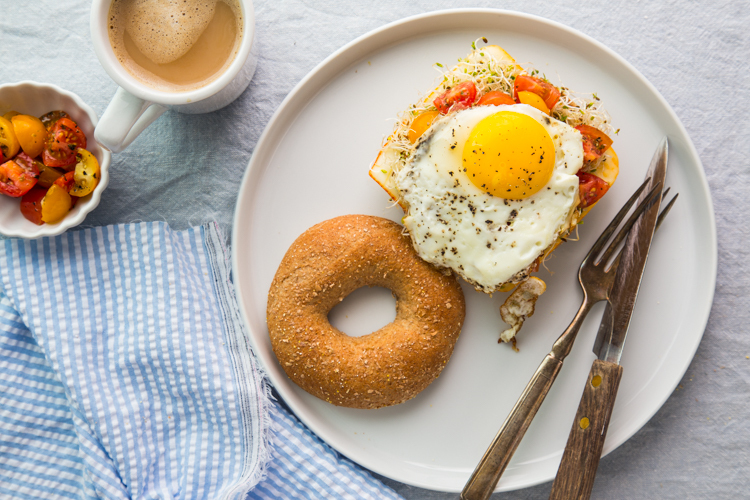 Love your veggie take on a breakfast sandwich – I’d gladly eat this any time of day, Em! That drippy egg in the last shot?? Yes please! I love a good messy egg sandwich!